Paterson, NJ (February 4, 2015) . . . New Era will be displaying several pieces of equipment at ICE USA 2015, among them a high speed, wide web turret unwind which allows for automatic roll changeover at full production speeds. Next to the machine will be a flat screen TV showing footage recently shot at Evergreen Packaging in Waynesville, NC, where an identical New Era unwind system is in operation. This equipment is designed to unwind 14,000 lb. 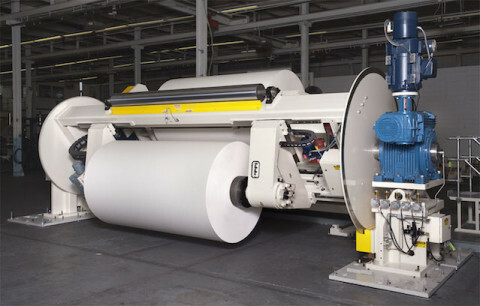 rolls of paper at up to 1400 feet per minute. A full Factory Acceptance Test (FAT) was recently completed on this unwind at New Era’s facility. Following the ICE show, this unwind will be integrated into an existing production line during a 24/7 turnkey installation handled by New Era. In addition, New Era will feature a custom built off-set slot die coater module for narrow web coating and a multi-roll kiss coater for applying coating to both sides of a web simultaneously. The offset slot die coating module design was finalized after several weeks of lab trials on New Era’s pilot coating line. Its features will transform the clients existing operation by substantially reducing coat weights and eliminating scrap, all while improving the products performance. Rounding out the largest booth at ICE USA will be a multi-bay drive panel featuring the latest technology Allen-Bradley drives. The control system is and Allen-Bradley ControlLogix processer mounted locally on the unwind turret described above. Finally, New Era’s John Looser will do a presentation on ‘Coating Methods – Gravure’ as part of the Coating & Drying Agenda at the CEMA Fundamentals Seminar on Monday, February 9th at 10:15 a.m. EST.